The man responsible for helping transform President Lyndon B. Johnson’s legacy is moving on from his role leading the LBJ Library and Museum. He shares some parting thoughts. Mark Updegrove (left) with President Barack Obama. Michelle Obama and Rep. John Lewis (D-Georgia) at the LBJ Presidential Library. For the past eight years, author and historian Mark Updegrove has led that library. He’s helped reshape the legacy of Lyndon B. Johnson – in large part with a political star-studded Civil Rights Summit a few years ago to mark the 50th anniversary of the signing of the Civil Rights Act. Now, Updegrove is moving on. He’ll be the CEO of the new National Medal of Honor Museum being built in Charleston, South Carolina. 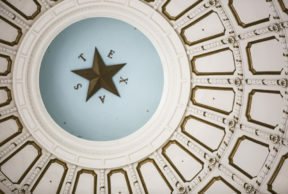 Texas Standard spoke with Updegrove about the work he’s done in the Texas Capital city over the past several years – and the job Updegrove thinks is still ahead in defining future presidential legacies.